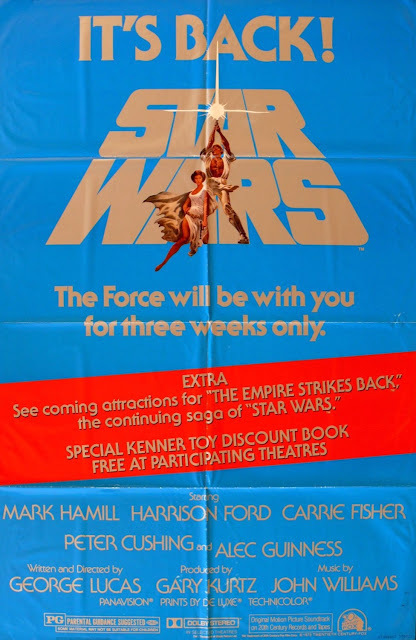 In August of 1979, Star Wars was re-released to theaters. The movie hadn't been out of public view for very long, but there were toys to sell and an upcoming sequel to promote...and, well, it was the late '70s, and it probably seemed wrong for Star Wars to not be in theaters. It seemed especially wrong come December and the release of Star Trek: The Motion Picture. ST:TMP was supported by a giant line of toys produced by Mego; in terms of special effects and merchandising, it was supposed to out-Star Wars Star Wars. 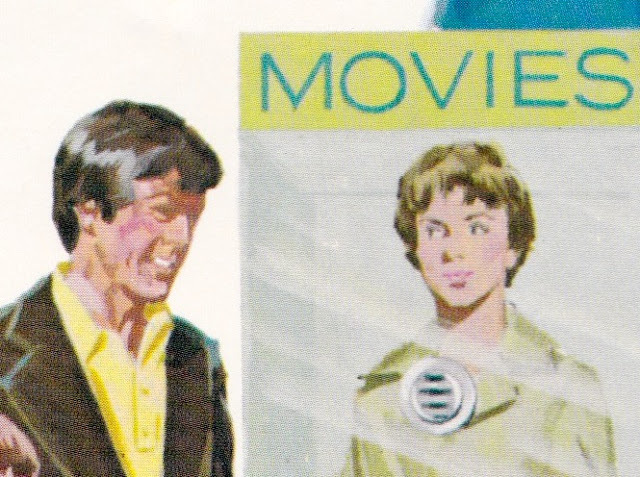 Rumor has it that several Mego execs, upon seeing ST:TMP, expressed regret that they hadn't instead pursued the toy license for Kramer vs. Kramer, the year's big hit, and a film in which stuff actually happens. 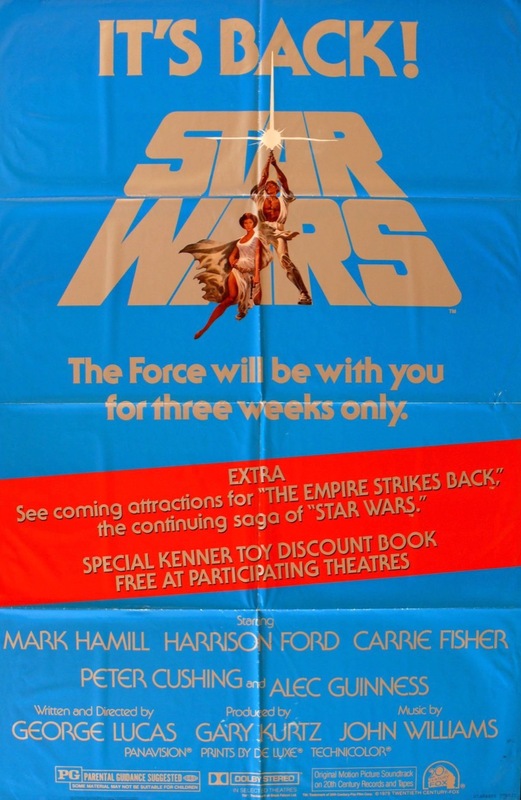 Above you see the theatrical poster for the re-release of Star Wars. 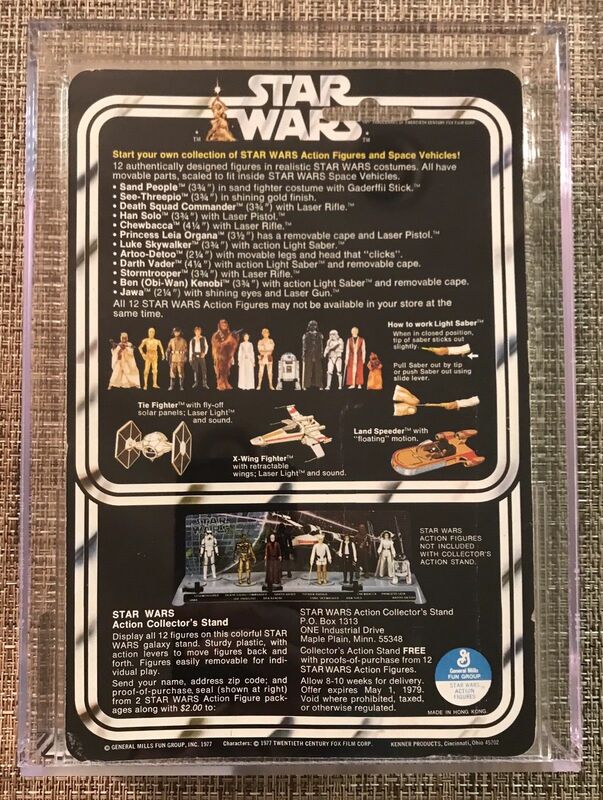 It's notable for the red snipe, positioned at a slight diagonal, that promotes both a preview of The Empire Strikes Back -- set for release in May of 1980 -- and a booklet providing discounts on a variety of Kenner Star Wars toys. Is this the first movie poster to explicitly advertise a toy line? 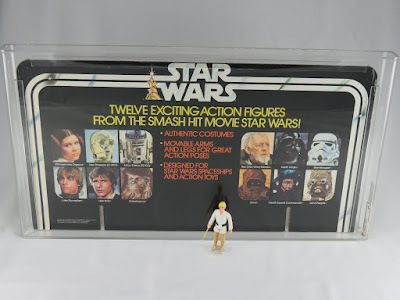 No, it's at best the second, as Fox had previously featured 11 Kenner action figures on the poster commemorating the one-year anniversary of the release of -- you guessed it -- Star Wars. Hmmm. 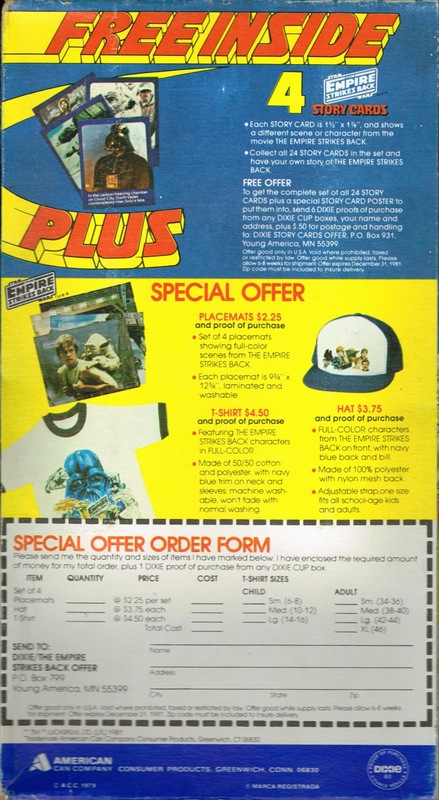 It's almost as though merchandising was sort of important to the whole Star Wars thing. The "It's Back!" 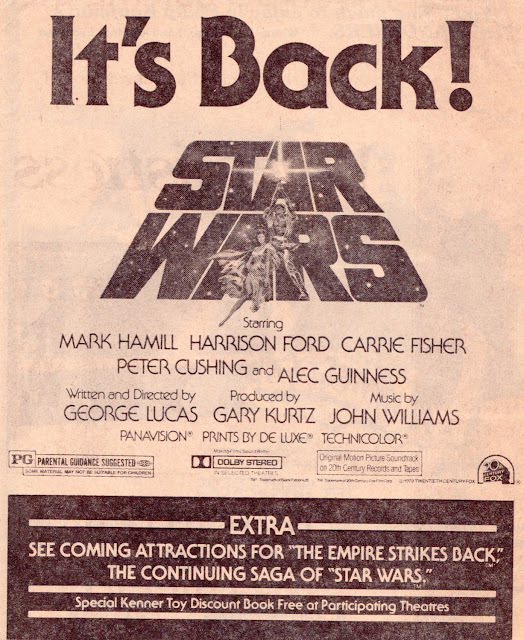 slogan also appeared in newspaper advertisements supporting the re-release. 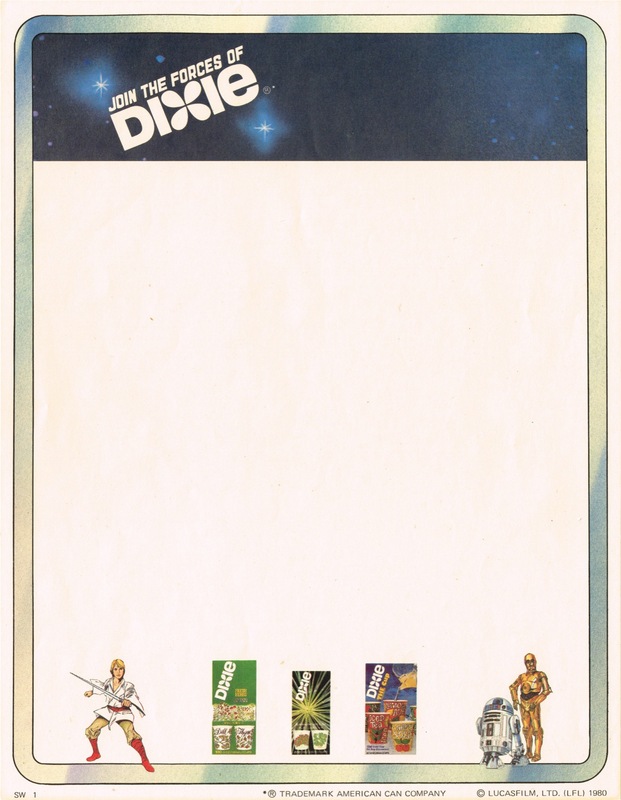 So did the snipe pimping the Empire preview and Kenner booklet -- though here the Kenner announcement was relegated to a rather small font, almost as though the toy tie-in was a little embarrassing. The ad was created using slicks such as the one seen above. These allowed theater proprietors to tailor ads to their localities. 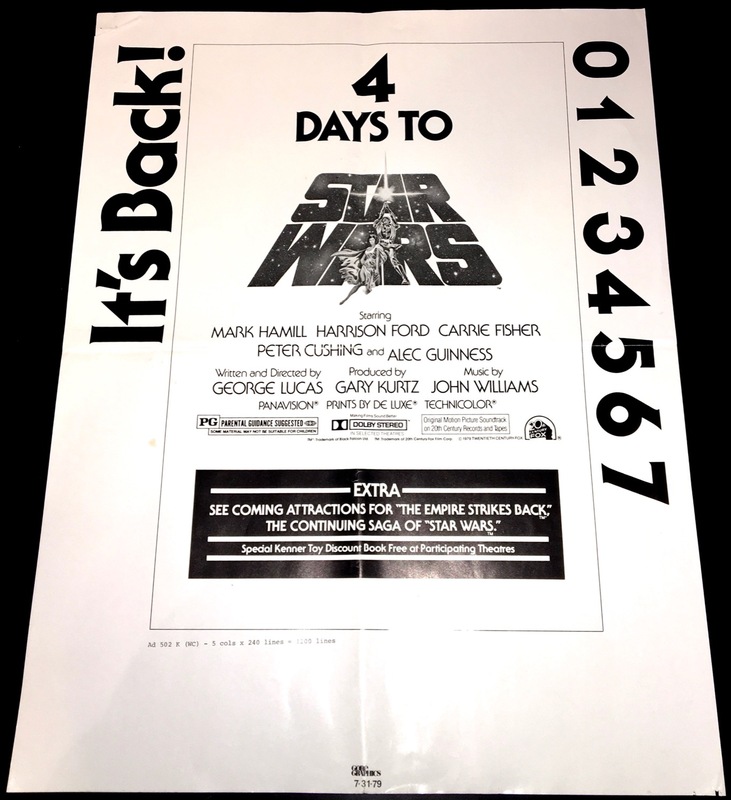 This particular slick facilitated the running of "countdown" ads over a succession of days. The numbers on the right margin could be clipped and placed over the "4" at the top of the graphic -- until, finally, the exultant "It's Back!" would make its grandly corny appearance once the movie entered theaters. The print ads may have demoted the Kenner tie-in to a tiny font, but Kenner was taking the promotion seriously. 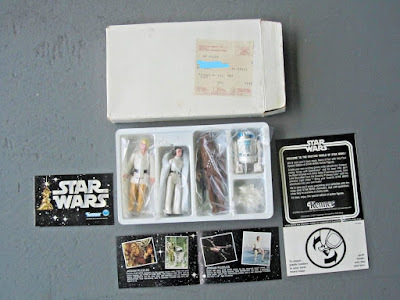 August wasn't too far removed from Christmas, and it's no exaggeration to say that, to the toy company from Cincinnati, the re-release of Star Wars was one big toy commercial. 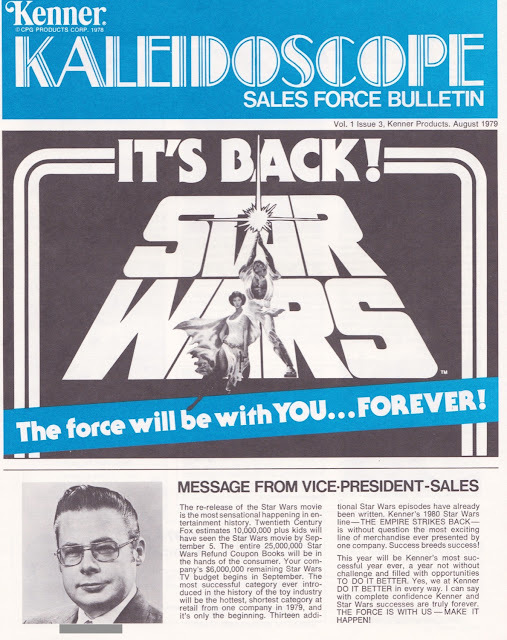 It's no surprise, then, that the August edition of the company's Sales Force Bulletin featured the re-release on its cover. It also featured a message from the VP of Sales, whom I call Herman Hyperbole. 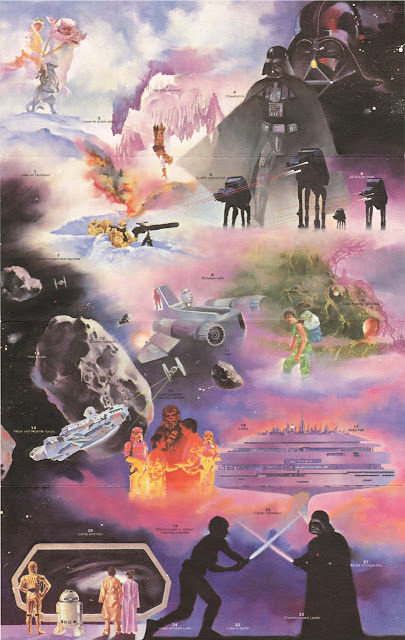 The re-release of Star Wars is the "most sensational happening in entertainment history." Not just in 1979 or in the '70s, but in all of entertainment history, going all the way back to, I don't know, that part in Caveman where Ringo Starr invents music. 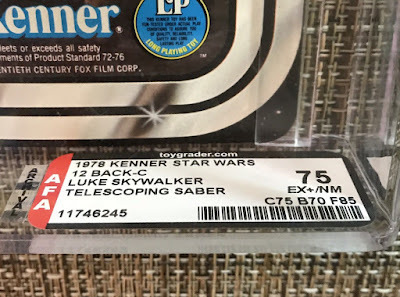 Kenner's imminent Empire Strikes Back line of merchandise is "without question the most exciting line of merchandise ever presented by one company." 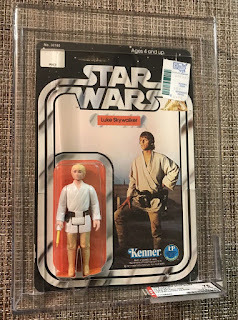 "This year will be Kenner's most successful year ever." The success of Kenner and Star Wars are "truly forever," like diamonds, herpes, or the Batman movie starring Val Kilmer. "Yes, we at Kenner DO IT BETTER in every way." I'm serious: We DO IT BETTER. No one can deny that we DO IT BETTER. And if someone tries to deny that we DO IT BETTER, throw up your hands, say "that's a lot of malarkey!" and walk away like you won the argument. "Thirteen additional Star Wars episodes have already been written." Wait....13 additional episodes? Including the original, by-then-already-released episode, that's 14 episodes in total. That's more than exist today, 40-plus years later, even if you include the Clone Wars movie and the two Ewok TV things (and, frankly, let's not). 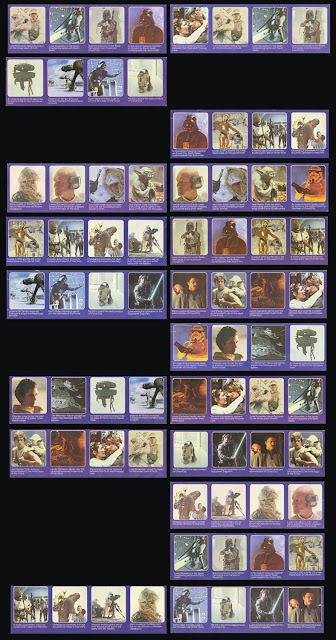 Now, I've heard nine and 12 posited as the number of episodes originally planned for the Star Wars saga, but never 14. Either Herman pulled that number out of his keister, or in preparing to write this he mainlined about a quart of the corn syrup that Kenner used to fill their Stretch Armstrong dolls. I suspect the latter, because there's no way someone can achieve that kind of vigor without at least a quart of corn syrup flowing through his veins. 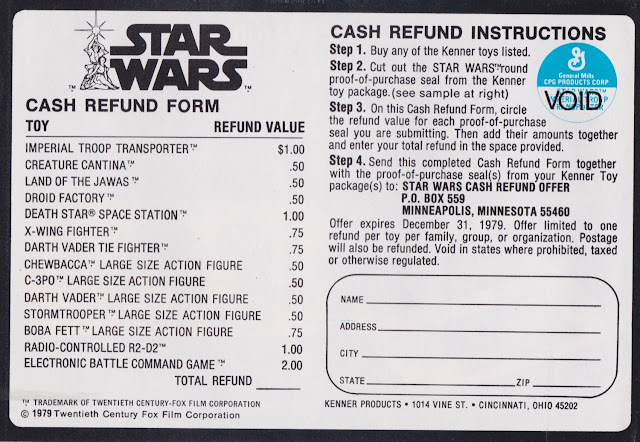 Here's the rebate booklet that was distributed at screenings of Star Wars in 1979. 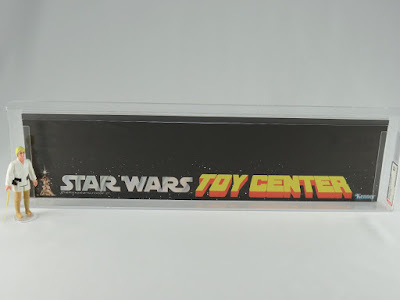 A lot of collectors assume it was included in toy packages, but as far as I know it was a theater-only thing. 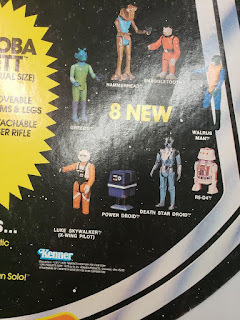 You may have noticed that, in the above-pictured Sales Force Bulletin, Herman states that Kenner planned to distribute 25 million copies of this booklet. That's a lot of booklets, especially when you consider that the re-release of Star Wars was scheduled to run for only three weeks. Maybe whoever printed the booklets was also mainlining corn syrup? In case you're wondering, $.50 in 2019 dollars is about $1.75. Now, Herman would probably tell you that no savings in all of recorded history was more sensational than that $1.75, not even those offered by Crazy Eddie, who was definitely mainlining corn syrup. But still...$1.75 is $1.75. You could play seven video games on that. 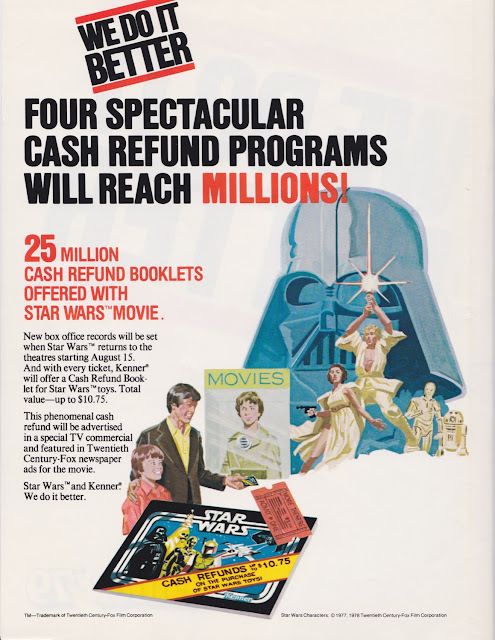 Actually, you couldn't, because while the 2019 value of $.50 is $1.75, the 1979 cost of a video game was the same as it is today: .$25. So enjoy those two extra turns on Asteroids, sucker. 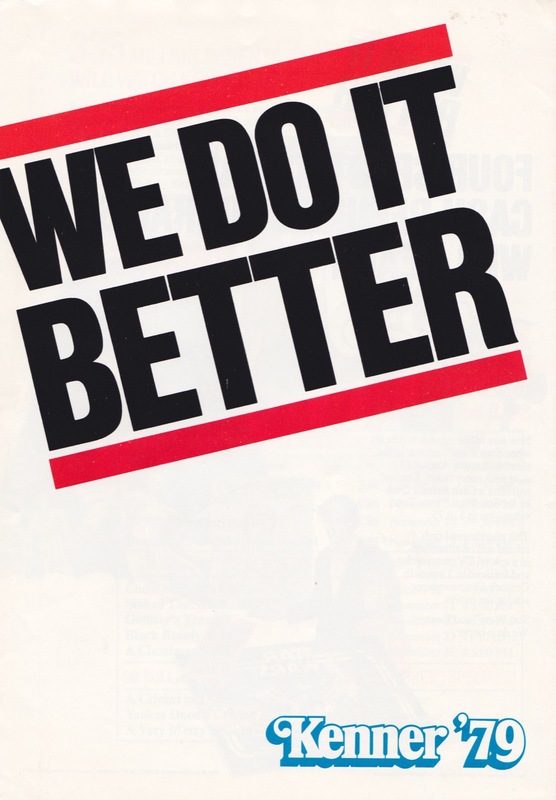 "We do it better" wasn't just a saying that Herman invented; it was an official Kenner slogan. They even issued a brochure for it. Do you find the slogan inspiring? 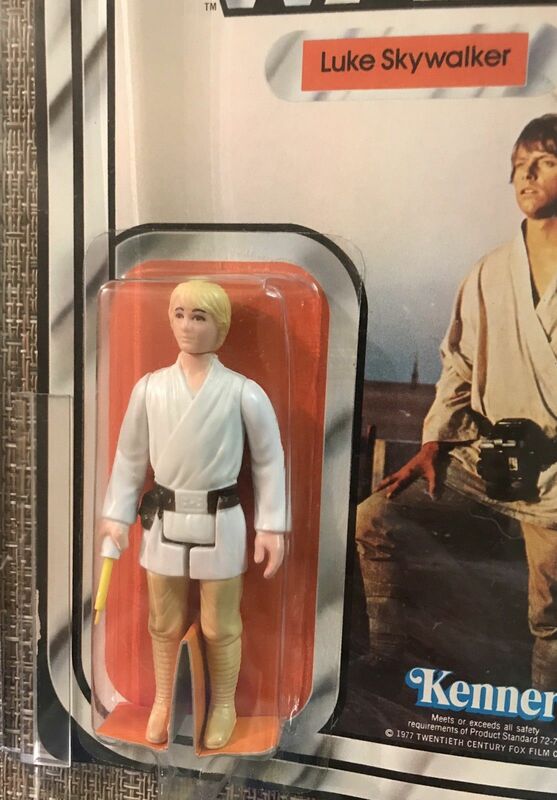 I don't have a strong feeling either way. If you were to drop the "we" and replace it with "rednecks," it might make a good bumper sticker. 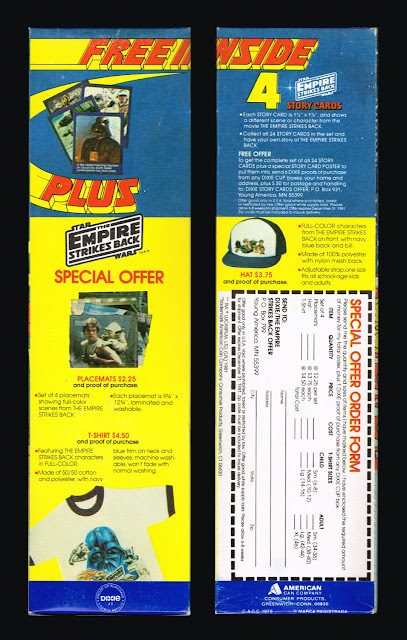 Here's the page of the brochure covering the rebate promotion. I tried to find the referenced TV spots on YouTube, but I gave up after a few minutes of clicking and sitting through ads. If you find them, please post them in the comments. By the way, what do you reckon is going on here? Dad, who is rather overdressed for Star Wars, seems oblivious to Box Office Lady's intense feelings of longing. Or perhaps he's doing his best to ignore them? 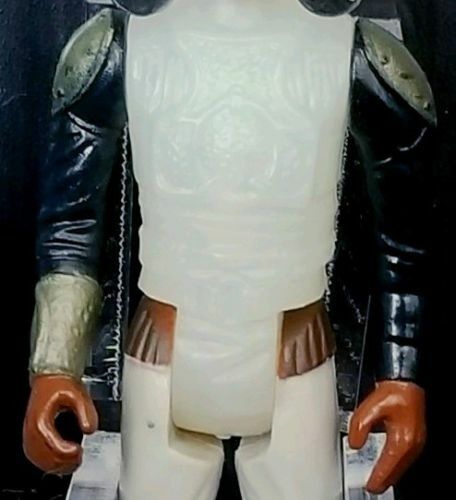 His smile says: "You will never pierce my shell of manly self-satisfaction, TicketWitch." The scene doesn't quite have the intensity of the final section of Bresson's Pickpocket, but it's close. 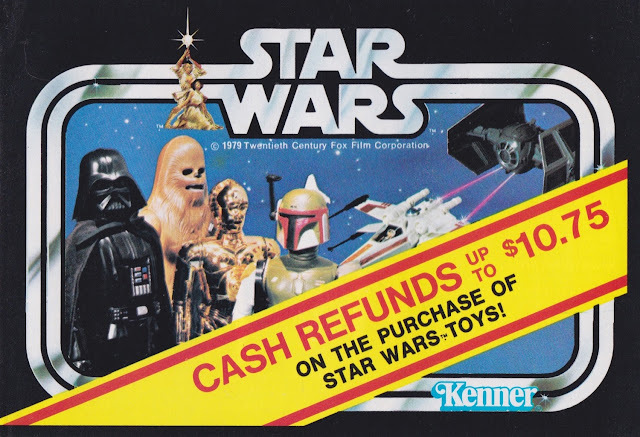 Did the re-release of Star Wars succeed in boosting Kenner toy sales? Based on the above newspaper article from the front page of a 1979 edition of the Los Angeles Times, I'd say that it did. 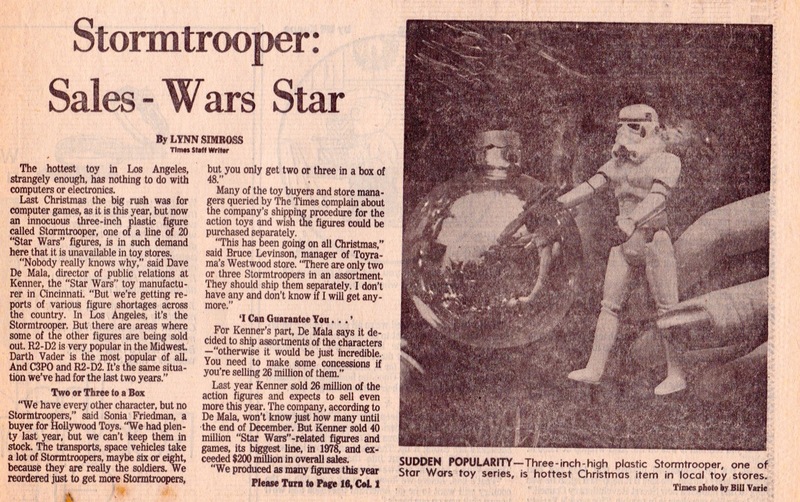 The article describes a shortage of Stormtrooper figures that afflicted SoCal during the holiday season of 1979. Despite the awkward headline (how terrible is "Stormtrooper: Sales-Wars Star"? 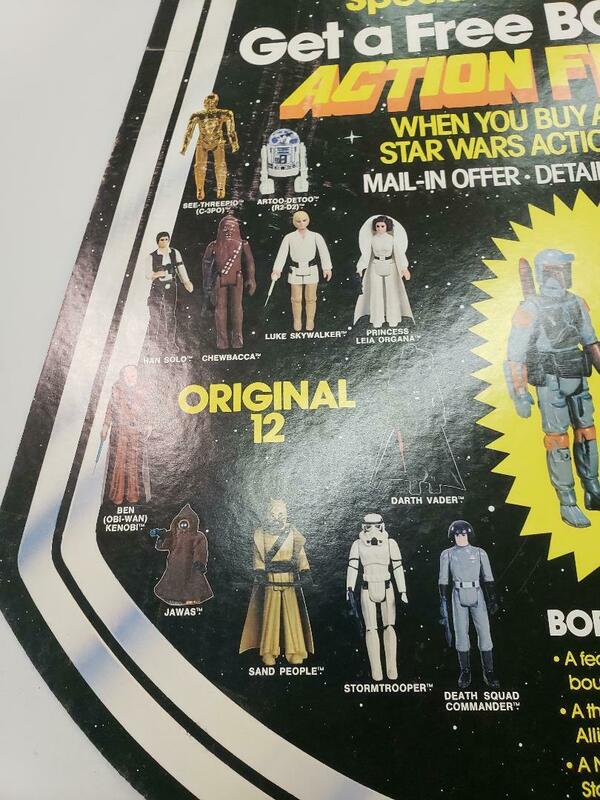 ), it's clear from the article that the the Stormtrooper shortage was no joke. It was hard out there. Toy shoppers were hobo'ing around dusty backroads in worn-down shoes, like the Okies in The Grapes of Wrath. 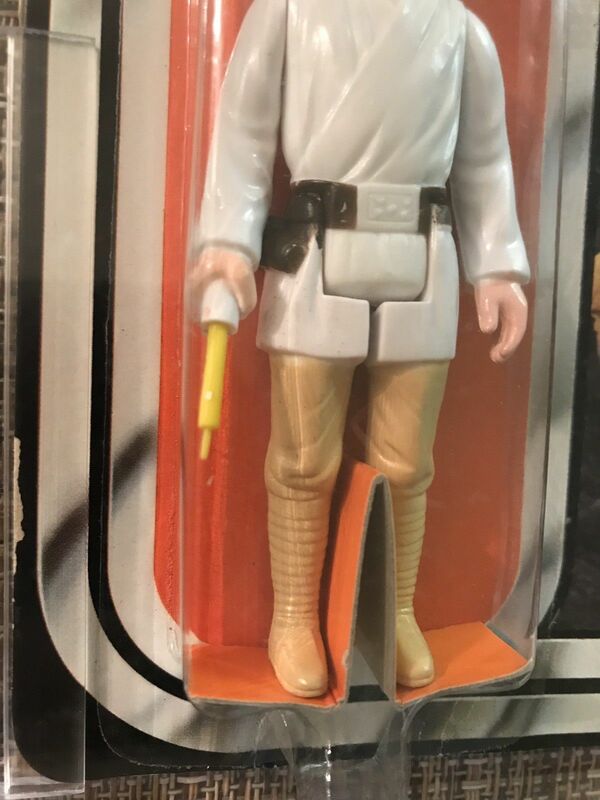 Toothless train bums were whittling Stormtroopers out of goat bone and selling them to sad-faced fathers standing in layaway lines. SoCal residents: How did you survive the Great Stormtrooper Panic of '79? I don't know about you, but I find the idea of R2-D2 being very popular in the Midwest rather funny. It makes him sound like Mitt Romney. 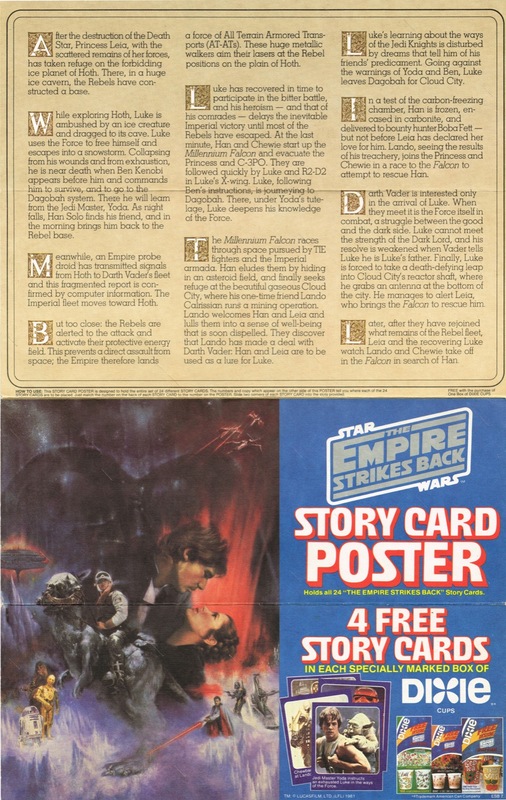 The 1979 re-release is mentioned on the article's second page. 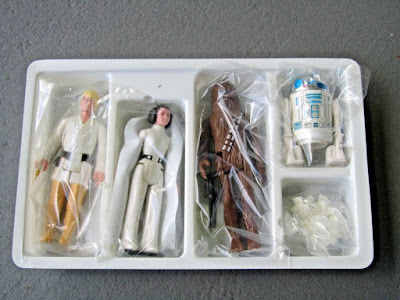 De Mala, as do local toy store representatives, gives some credit for the popularity of Star Wars games and toys to the fact that the movie, which originally came out in 1977, was re-released by 20th Century-Fox in August, creating new interest in the toy items. So there you go: A marketing triumph! 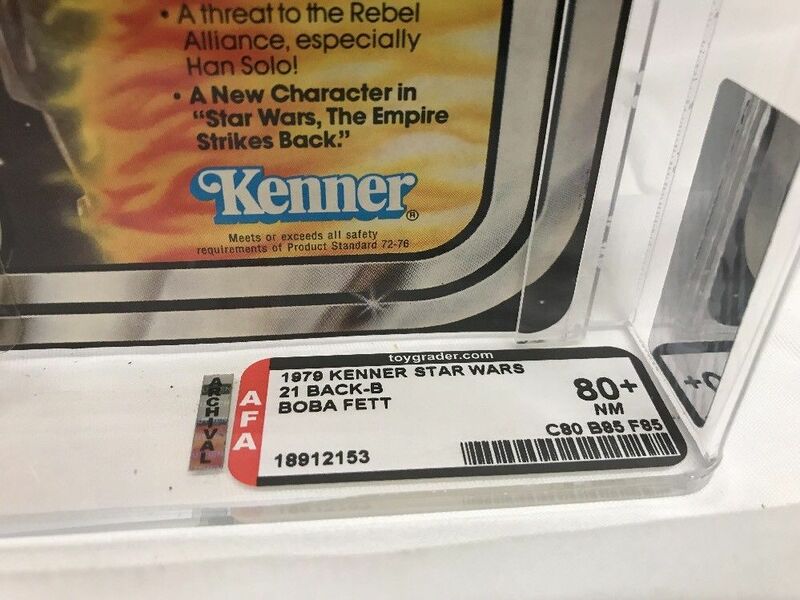 Also mentioned: A weird conspiracy theory, apparently held by some in South Carolina, which blamed a fire at one of Kenner's factories for limiting the availability of Star Wars action figures. 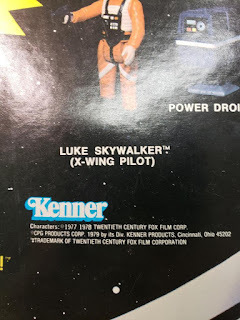 Kenner spokesman Dave De Mala denied the rumor, but I suspect he was hiding something, and that the Great Stormtrooper Panic of '79 was an inside job designed to encourage newspaper editors to write articles about how the folks at Kenner simply DO IT BETTER. Do Dixie Cups count as food? If you're not a goat, probably not. But that doesn't stop food collectors like Jonathan McElwain from pursuing them. Be thankful that they do pursue them, because if they didn't we wouldn't have great articles like this one to bring us up to speed on Dixie-related ephemera. So here's Jonathan to drill down into the details of Dixie's Story Cups promotion. Maybe he'll convince you to, as the stationary says, "join the forces of Dixie." 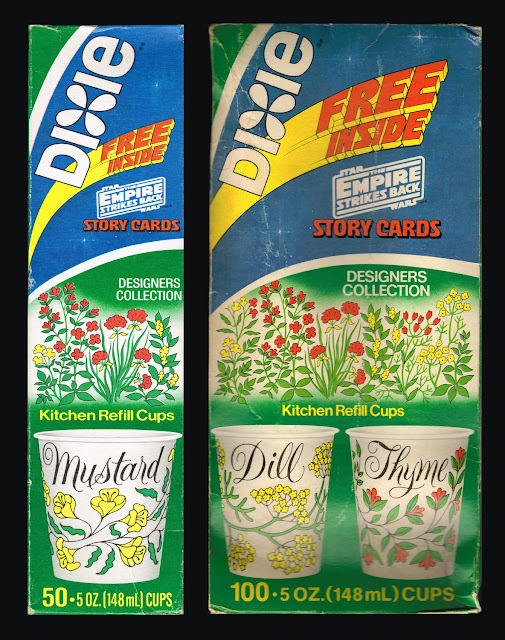 The Story Cards promotion was the second Star Wars promotion involving disposable paper Dixie Cups. 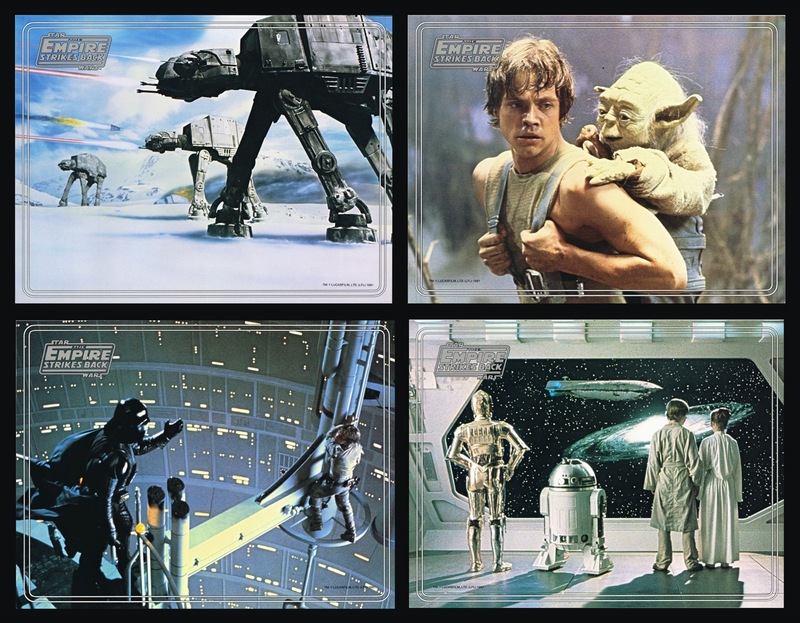 The first promotion, which featured artwork on both the boxes and cups from the original Star Wars, actually coincided with the theatrical release of The Empire Strikes Back in May 1980. That first promotion was quite successful. 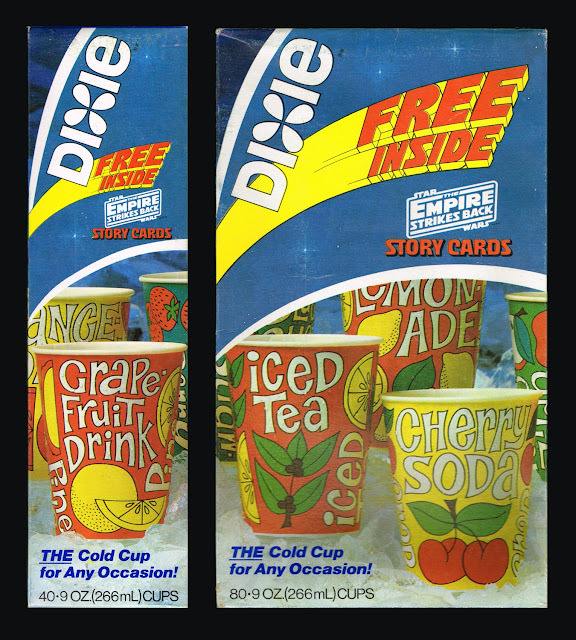 According to marketing materials sent to vendors, sales of Dixie Cups were up by 85% during the period between May and December 1980, relative to the same time period in 1979. So, it made sense for the American Can Company to continue with ESB-themed promotions. 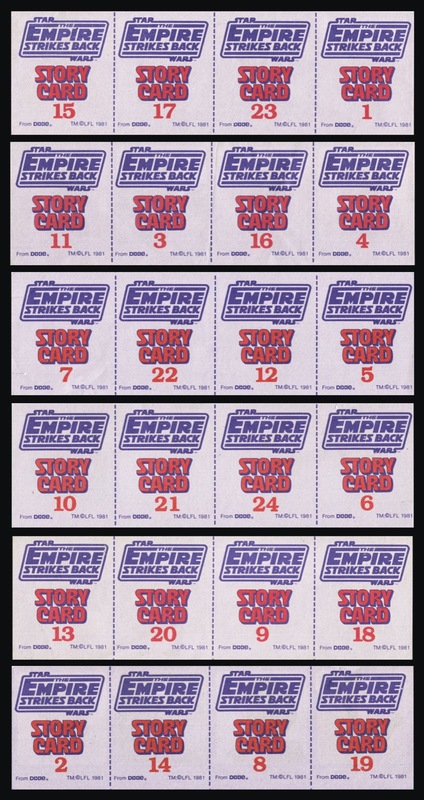 The full-blown Empire Strikes Back promotion would follow in June 1981. 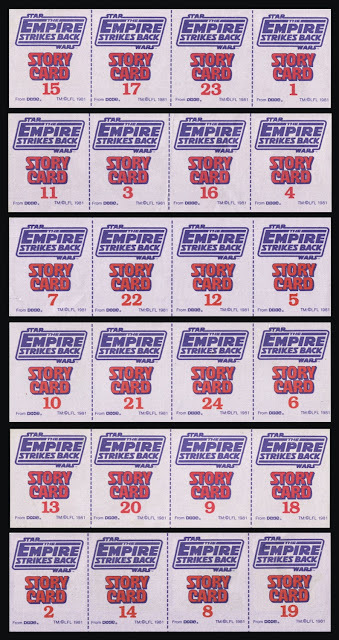 The Story Cards promotion was a warm up of sorts, which took place primarily in April and May of 1981. The promotion was featured on 3 oz. 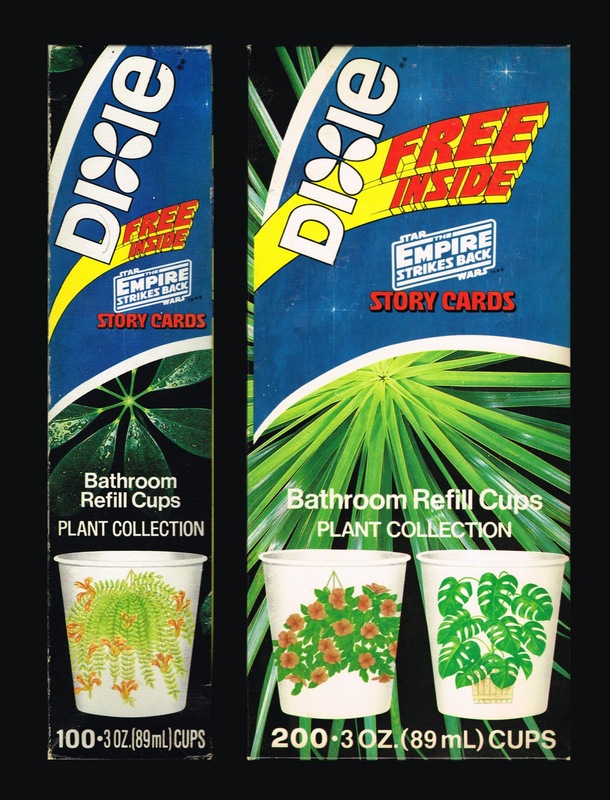 Bathroom Refill Cups, 5 oz. Kitchen Refill Cups, and 9 oz. THE Cup boxes. Unlike the various Star Wars-branded promotions, which were fully themed with artwork based on the films, this promotion ran on boxes of common Dixie Cups with a promotional snipe added to the front of the box. As far as I know, there were a total of 12 boxes included in this promotion. To be clear, these 12 boxes are all that I’ve been able to find in over a decade of collecting them. It is possible that there are other variations that remain undocumented. There were a few other contemporary Kitchen Refill cup designs, but none of those have been found with the Story Cards promotion on the boxes. While I would hesitate to call them rare, these Story Cards boxes are significantly more difficult to find than any of the four series of Star Wars-branded boxes, excluding their Canadian counterparts. 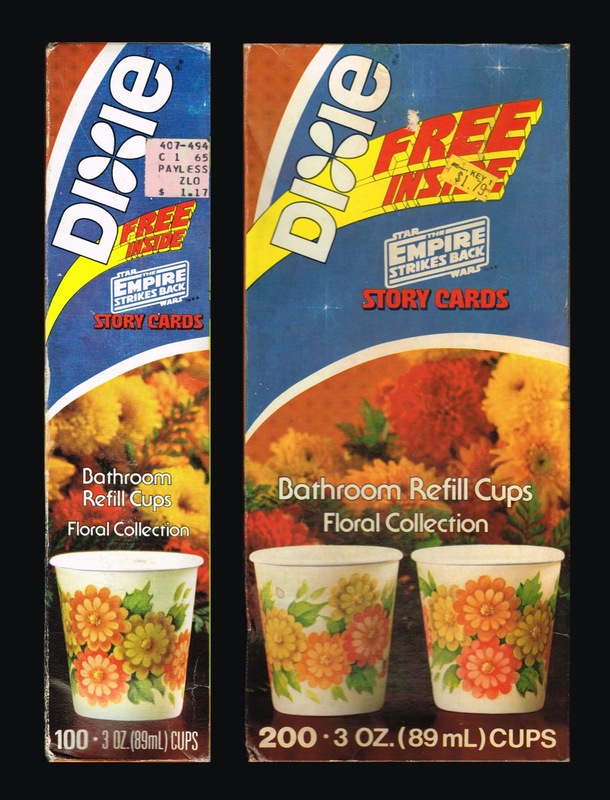 Each box of Dixie Cups included four Story Cards. 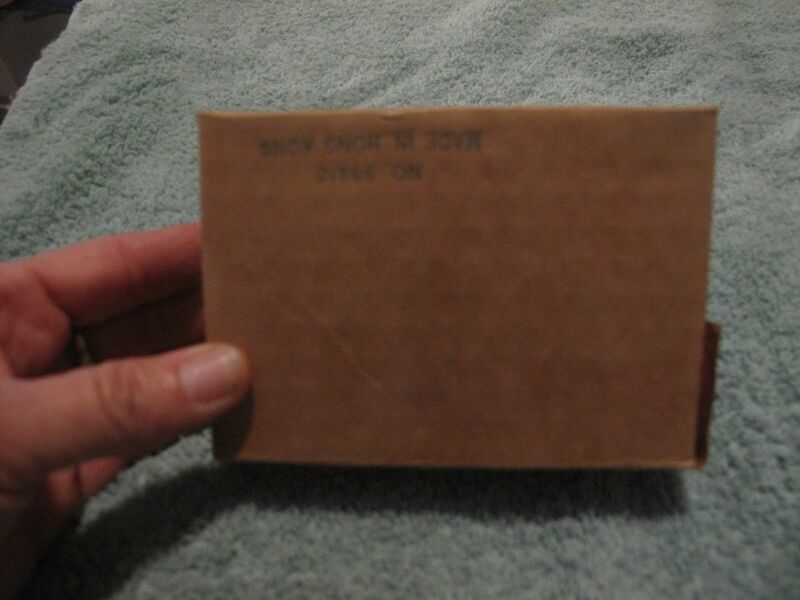 These four “cards” were printed on a thin paper stock strip. The card strip was rolled and placed within the uppermost cup in the top of the box. It is common to find the strips with one or more cut in the card on the ends of the strip. I assume these cuts were created in the process of cutting the strips from a larger sheet. So, what are you actually supposed to do with these Story Cards, if you aren’t an OCD collector like me? 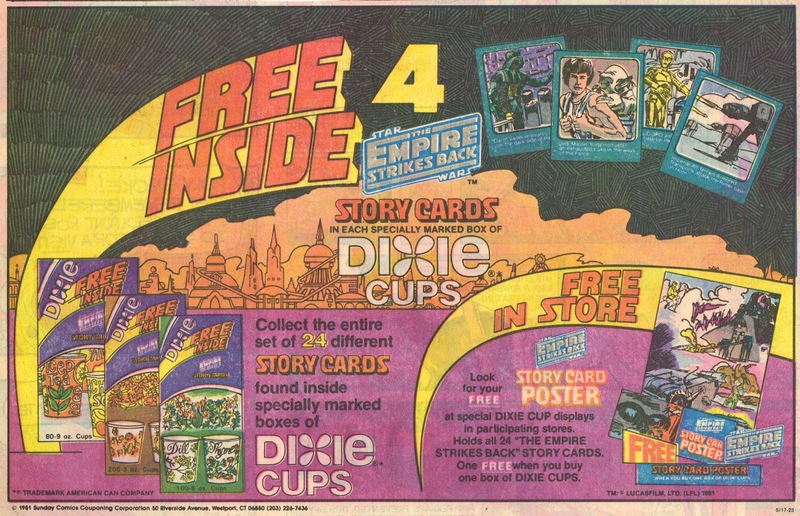 Collectors of the time were able to obtain a poster from this in-store display, with purchase of one box of Dixie Cups. 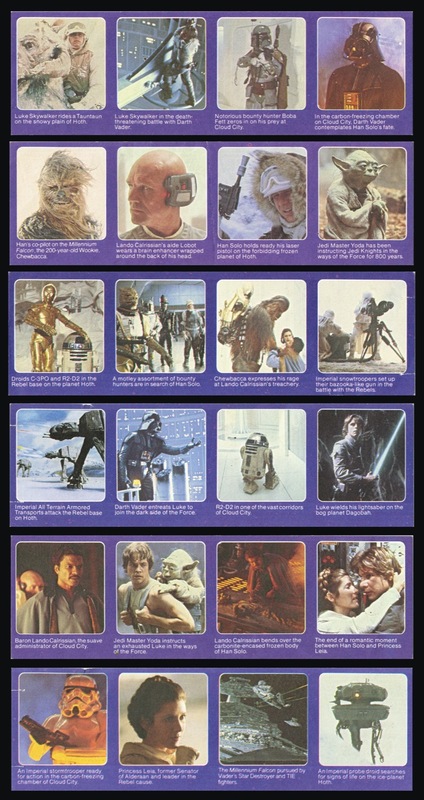 It was also possible to obtain the poster, along with a full set of cards, by mailing in 50 cents along with six proof-of-purchase seals. The poster has diagonal slots into which the corners of the individual cards can be placed. Once completed, the poster tells the story of The Empire Strikes Back. Other available items included a T-Shirt and a Hat. 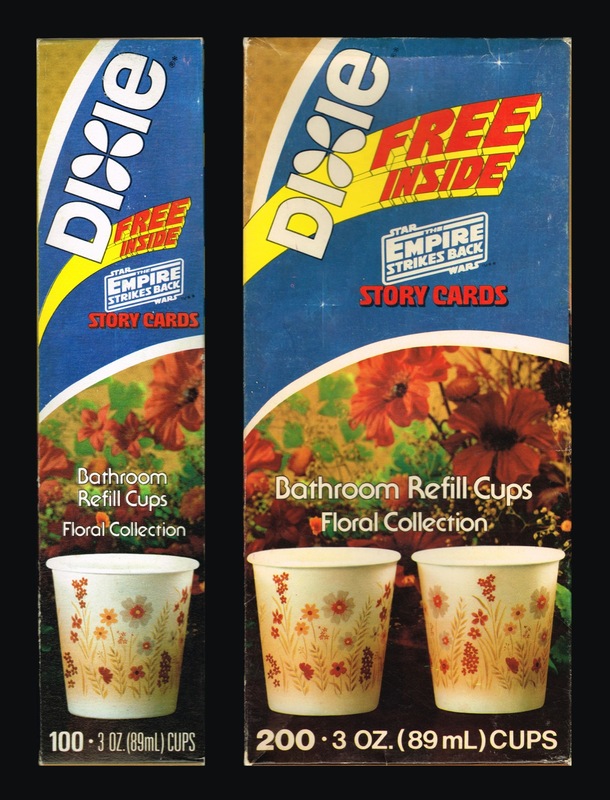 The T-Shirt is a collage of images that would be featured on the ESB branded Dixie Cups boxes, so it is a preview of what was to come next for the Dixie Cups line. 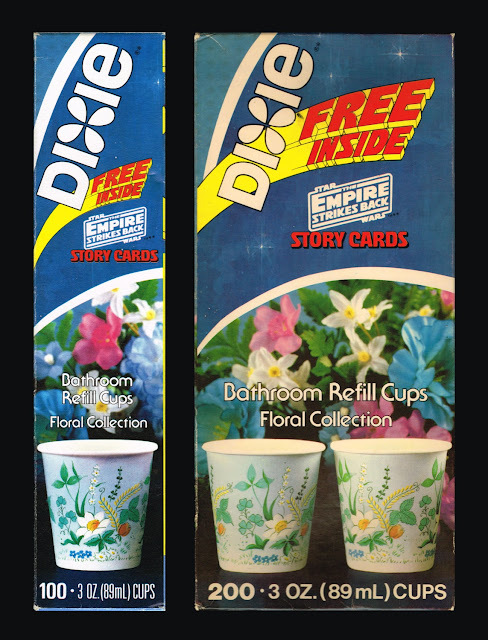 Dixie Cups are a fun area to collect. This lesser-known promotion has a surprising amount to offer collectors. I hope to cover some of the other Dixie Cup promotions in future blog posts. Happy New Year Space Freaks! It’s 2019 and I’m here with your first look at the market in the New Year and how we closed out 2018. Last year was a bit of a mess in the world of Star Wars with split opinions on a saga film along with lackluster or non-existent feedback on the most recent spin-off Solo, it was a bit of an off year for the franchise from a film perspective. 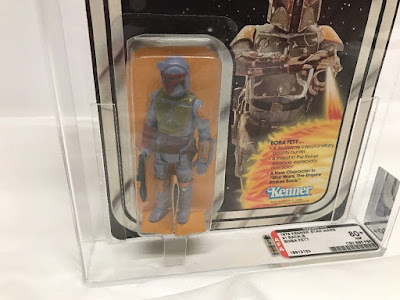 Additionally we saw the company reaction, which resulted in the cancelling of a previously announced Boba Fett movie and any other spin-off films that were being developed. On the non-film front we had the announcement of the partial slate for the Disney Streaming service that is launching in the coming year. 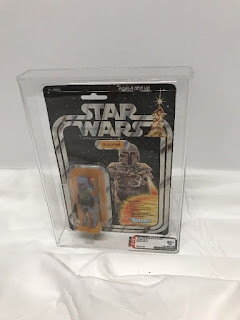 With the ever familiar and popular Clone Wars series returning and the addition of the first ever live action Star Wars series The Mandalorian, fans new and old have something to look forward to. The lack of progress in the narrative as well as the contrast of generally negative feedback on its primary character-developing channels had an impact on the market as well. We didn’t see fallout on a major scale, but we saw the softening of other segments. Outside of the hobby the overall global economic environment was a bit less stable, but nonetheless growing. 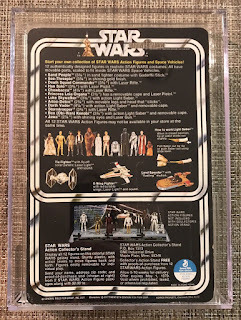 The economic trends as usual had some impact on the hobby, but it was immaterial at best from a price perspective with more of an impact on volume. Needless to say, with a generally healthy economy in most parts of the world the hobby saw generally good performance this past year. With that being said, let’s look at a few things that hit the market as we closed out 2018. Our first piece has become a staple of the MarketWatch over the years, as we try to incorporate sales of this special piece into the articles whenever one appears. Still by any standard an iconic piece in the Star Wars universe, the rare MOC double-telescoping variant of the series' primary protagonist is as iconic and timeless as the movies themselves. This piece was down significantly from the $12-$15K range we had been seeing on these, however with quite a few coming into the market in the past few years this piece may be losing its luster. 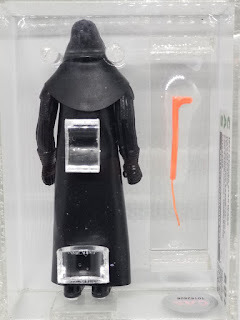 In the same vein as our first item, here we have the rarer DT figure of the pair: Darth Vader. With several variations of the double telescoping Vader saber out there, here we have the more traditional version of the saber. 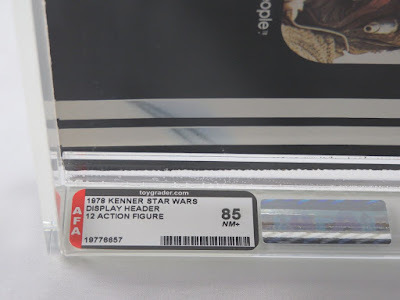 Overall a good deal with AFA 85 examples pulling $10K, given the lower grade and the distance between an 80+ and 85 in the eyes collectors I would say that this is about right. Ever popular and in high demand, the 21 back Boba Fett is easily one of the most desirable MOCs of any toyline from 1970-1990. 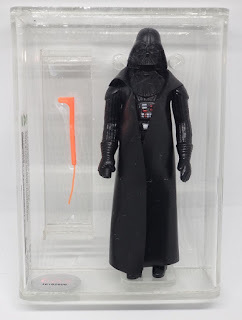 Here we have a great example of the figure in 80+ condition. Even with a bit of a light end to the year, this piece managed to pull in a good finish. 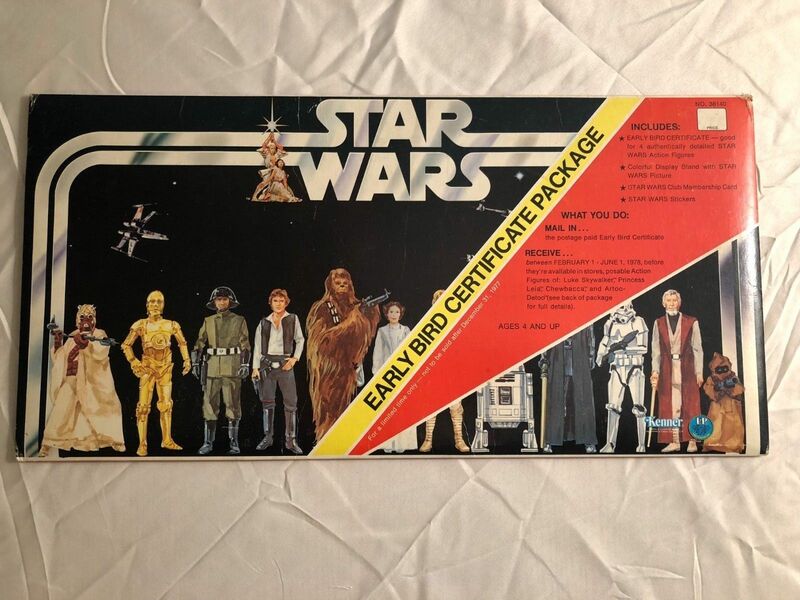 Here we have a pair of Early Bird items: the Certificate and the EB set itself with a DT Luke. These pieces have a wide range in terms of value and tend to follow the overall trends of the market from a price perspective. 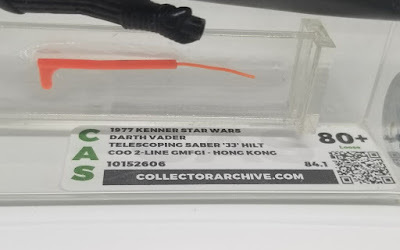 It does seem that some of the Early Bird pieces have lost some of their attractiveness to the general collecting community over the years, at least in terms of public transactions of pieces. This could be due to what seems like better availability and a bit of saturation as next tier items such as the Early Bird display have grown in popularity and demand over the past few years at a strong rate, while certificates and EB sets have fallen off slightly. In both cases here the prices seemed very fair given the condition of the items. 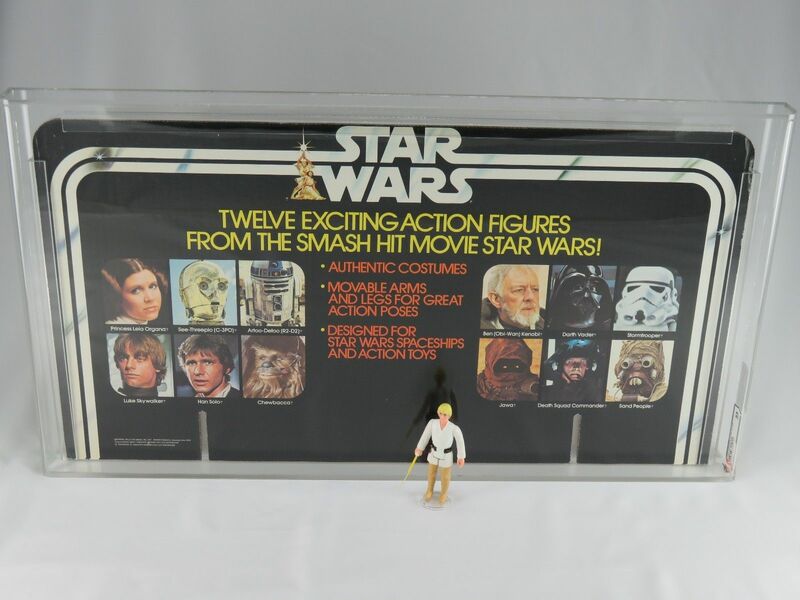 Moving onto another niche in the hobby, we have a few examples of staple display pieces. First, a Star Wars header display with the original 12 characters -- one of the most common header displays and also one of the more shippable/displayable of the series given its relative small size. This particular one did extremely well, especially give the market. Condition was definitely a factor, but the pairing with the shelf talker made for a nice combination. 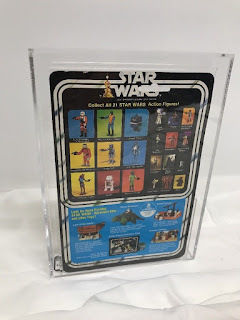 The shelf talk itself was a very nice example as well, but fell short of the header which was surprising seeing headers typically sell for around $1,200 and Toy Center shelf talkers sell for around $1,500. 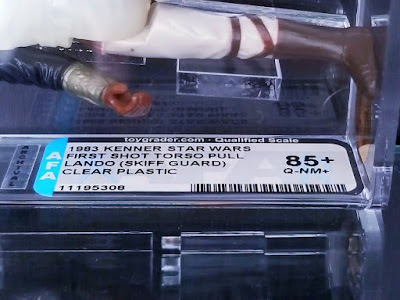 Again, finding an 85 of the header display is more difficult than finding an 85 shelf talker, but the shelf talker definitely fell short of where it would typically. 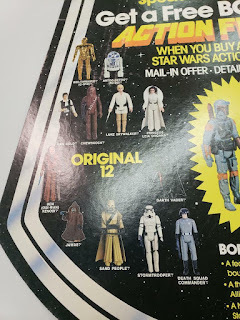 Another great set of auctions that hit the market in the last part of the year were a series of first shots from the vintage line. 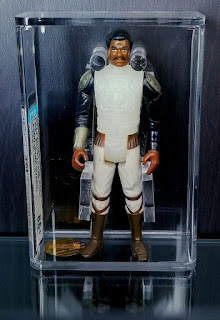 Here we have Lando Skiff Guard with a first shot torso and production head and limbs. A popular item to put together from some of the Kenner first shot parts that have been found over the year, I’ve happily come to refer to him as FrankenLando. 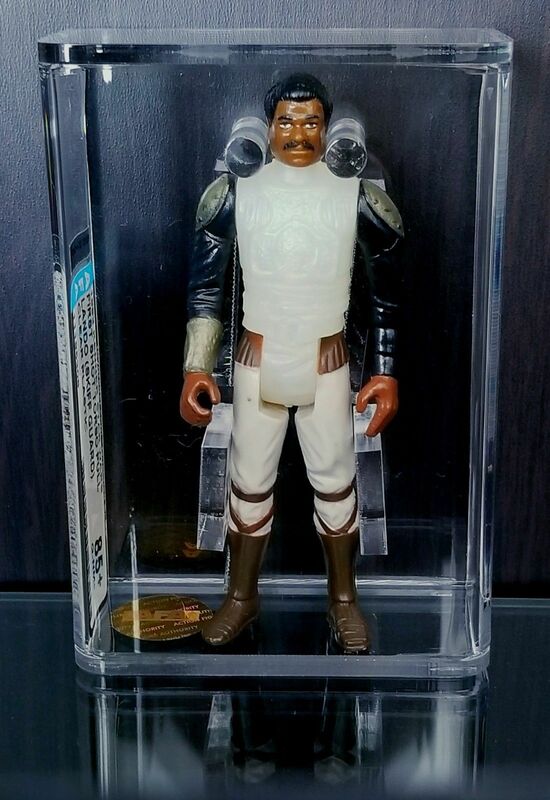 The seller posted several other pieces as well (including an Admiral Ackbar), all employing a high starting price which eventually was the winning bid in many cases. Price-wise I think this is right on to slightly low, but given the starting price I’m sure a lot of would-be buyers may have passed him up. Going into one of my favorite areas, we have a very nice example of a great figure combination via a department store multi-pack: Boba Fett with Luke X-Wing. 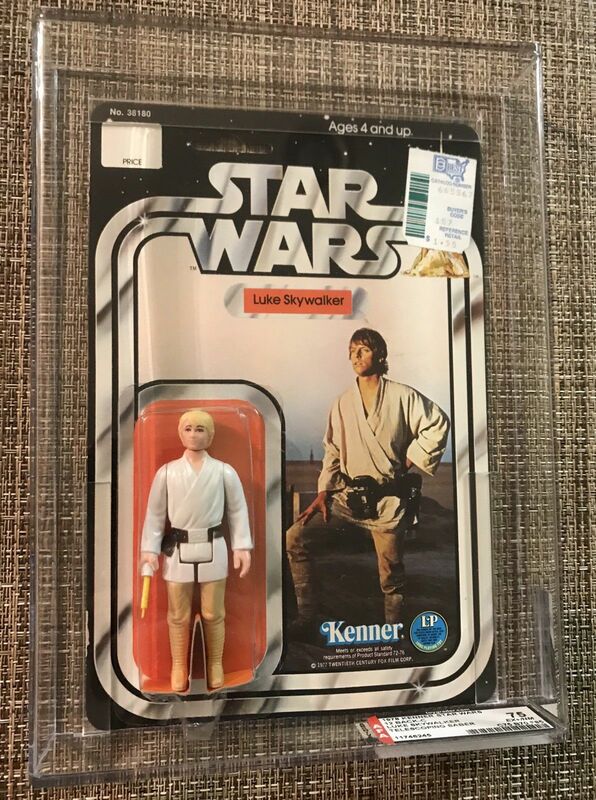 Still sealed and in overall great condition, I’m actually surprised this particular auction didn’t break the $2K mark, but timing was rough on this as December and November tend to be two of the worst months of the year. Then there was one of the tougher displays in the production lineup. 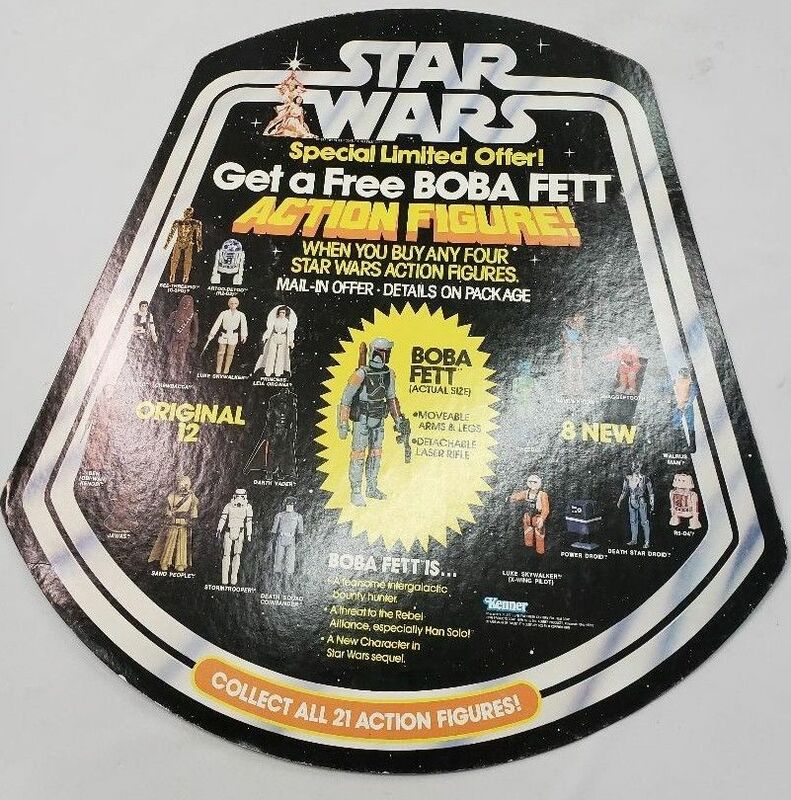 The Free Boba Fett Bell is something that holds a great deal of desirability among many collectors out there. A niche item along with most of its display brethren, it’s one of the highest valued items in the series. 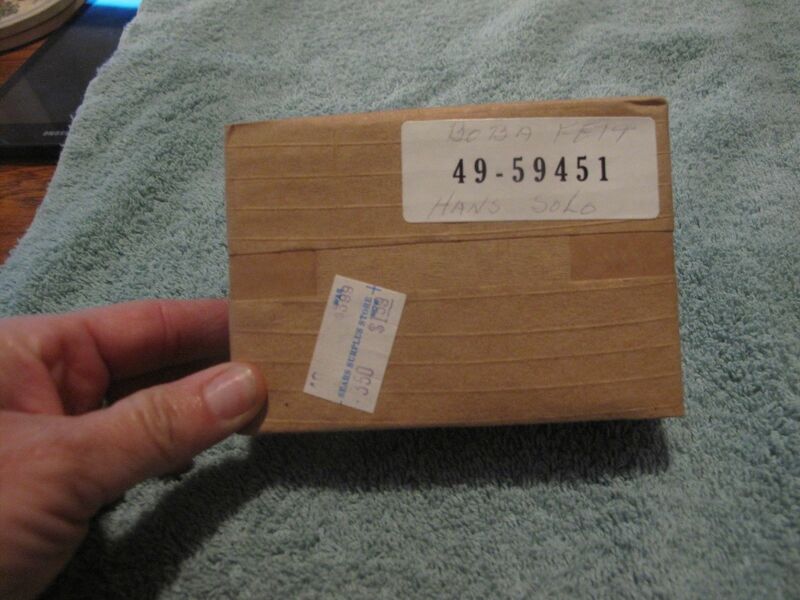 In this case we see a resulting value of $8,109. Interestingly enough, $7,000 of the final price came via bids in the last 60 seconds. 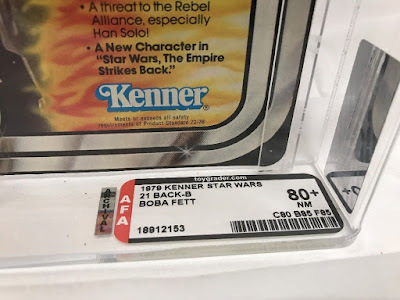 With 18 graded by AFA and several others like this one in collections, these have become more available than they once were. 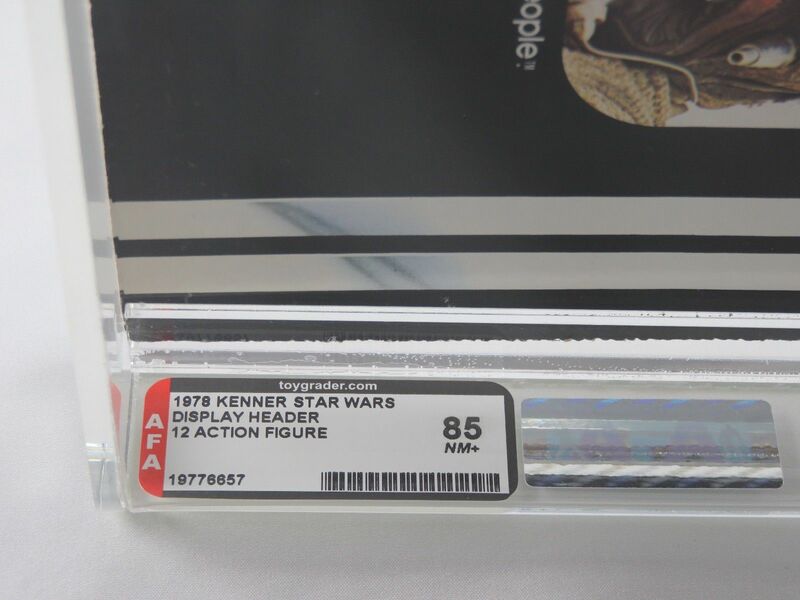 However, they still demand high prices with graded examples fetching into the $10,000 + range. 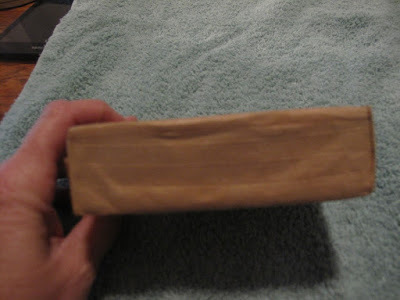 Thus, this result was a great buy for the buyer given they had no AFA premium, and the item itself had some surface and edge wear -- both elements leading to the lowest priced example to sell in recent history. That’s all for this season! Check back for more MarketWatch and everything vintage here on the Archive.